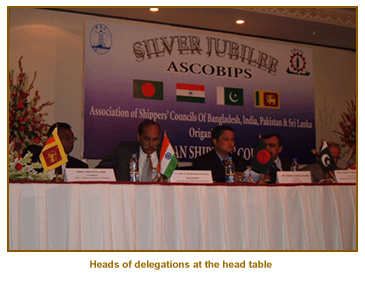 Pakistan Shippers’ Council (PSC) of Federation of Chambers of Commerce & Industry (FPCCI) hosted the Silver Jubilee of Association of Shippers’ Councils of Bangladesh, India, Pakistan & Sri Lanka (ASCOBIPS) on 28th and 29th July 2005. The celebration started with Inaugural Function held at Hotel Pearl Continental Karachi on 28th July 2005. Captain Anwar Shah, Additional Secretary and Director General, Ministry of Ports & Shipping was the Chief Guest. Apart from the member Countries namely, Shippers’ Council of Bangladesh who are also holding office of the Chairman, ASCOBIPS, Pakistan Shippers’ Council, All India Shippers’ Council and Sri Lanka Shippers’ Council attended the meeting. They were joined by the Chairman of Asian Shippers’ Council and Western India Shippers’ Association. The Shipping Industry of Pakistan in particular and Business and Trade Community attended the Inaugural Function in general. Capt. Anwar Shah, the Chief Guest also offered Presentation on “Maritime Facilities in Pakistan”. The Presentation was very informative and comprehensive which covered present success stories of Ports and related Industry and its future projects and prospects. A Welcome Dinner was also hosted by Pakistan Shippers’ Council in honor of the foreign delegates to celebrate the Silver Jubilee of ASCOBIPS. Rear Admiral Saleem Ahmed Meena SI (M), Chairman, Port Qasim Authority was Chief Guest at the Welcome Dinner. Vice Admiral Ahmed Hayat HI (M) Chairman, Karachi Port Trust also attended the Welcome Dinner. The following day, Members Association had an Internal meeting at the Federation House, whereby delegates discussed common issues relating to shipping faced by member countries, it was agreed that ASCOBIPS members will unite under the banner of ASCOBIPS to face the challenges which the shippers in the region are facing. To bring pressure on member states to withdraw the Anti Trust Immunity granted to shipping lines and to support the efforts of the European Shippers Council and the Asian Shippers Council to do so. To persuade the respective governments to enact laws relating to free trading practices specially focusing on shipping and maritime matters. To work together and exchange information on trade facilitation. The meeting observed that to improve the competitiveness of all four countries, it is very important to cut down the cost of doing business for which measures of trade facilitation are imperative to adopt. 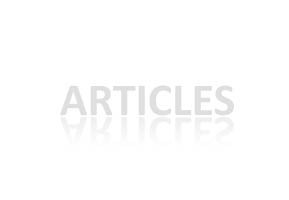 To develop a mechanism which could provide a platform for discussion between shippers and shipping companies viz a viz freight rates and related charges. Pakistan Shippers’ Council (PSC) believe that all charges should be part of the freight and a Shipper / consignee must know the total cost of the product before same is transacted. Ministry of Ports & Shipping May assist by convincing the authorities to do away with the No Objection Certificate (NOC) requirement from Pakistan National Shipping Corporation (PNSC) and make a policy change to allow National Flag carriers of India and Pakistan to load / unload cargo of third countries as well as no shipping line can survive only on bilateral trade. That Pakistan National Shipping Corporation (PNSC) and Bangladesh Shipping Corporation (BSC) may develop a regular service between the two countries which is long outstanding demand of the shippers of both the countries. Similarly, we recommend that after signing the Free Trade Agreement (FTA) with Sri Lanka, more frequent service should be encouraged between Karachi and Colombo to take care of the increased trade volume expected. The celebration ended today with an aim that All the Regional Shippers’ Council will join hands together and will exchange notes and experiences for the betterment of their respective countries in particular and for the region in general. 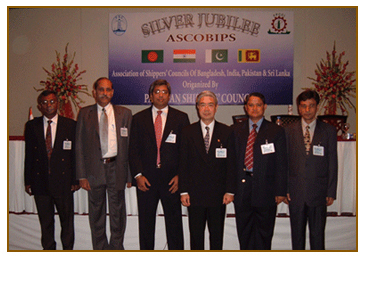 The Chairman of ASCOBIPS will continue up to June 2006 with Bangladesh. By rotation mutually agreed between members India will assume Chairmanship thereafter. Members appreciated the efforts of the Pakistan Shippers Council in organizing the Silver Jubilee celebrations.